It seems as if the 2014 Acura RL has been caught in the open doing high-altitude testing in this spy shot taken outside of Avon, Colo. The 2014 Acura RL is based on the Acura RLX concept that was introduced at the New York Auto Show. The RLX Concept's all-new 3.5-liter direct-injected VTEC V-6 engine and Sport Hybrid SH-AWD system, with three electric motors, will combine to generate more than 370-horsepower, and are paired with a 7-speed dual clutch transmission and will deliver V-8 acceleration with four-cylinder fuel economy—with an estimated EPA (city/highway/combined) rating of 30/30/30 mpg. Of course, to be upfront, there is a nagging doubt that it might not be the new Acura RLX because the chase car with it is clearly an Infiniti M Class, but was that intended just to throw the scent off? Infiniti doesn't seem to have anything in the pipeline that would be ready for testing at this point with minimal camoflauge. The reason we feel this is the new Acura RL is from nothing you can see in this photo: the front end. This car was originally spotted during the media introduction of the 2013 Audi All Road, Audi A5, S5, A4 and S4. On the test drive route from outside of Denver to Avon, this test mule was parked alongside the road at about 10,000 feet. By the time my driving partner, Neil Hicks III from CarFanaticsForum.com and I pulled up next to it, the engineers got spooked and pulled a U-turn right in front of us. They provided us with a strong view of the front-end of the Acura RLX but without time for either of us to even snap a cellphone picture. Fast forward to the next morning when we're heading from Avon, Colo., back down to Denver. Eagle eye Hicks spots the Acura RLXsitting in a parking lot of an abandoned building. This time we're able to sneak up on the car, which is no longer alone but is joined by this Infiniti M Class. We have time to snap rear-angle photos of the car. Hicks is a little more brazen and walks behind the Acura RL for more photos. That's when the engineers in the chase car spot us and hop out with nervous smiles on their faces. I call out to them, "You picked a bad place to do testing because this road is crawling with automotive journalists." The nice Japanese men just nod and smile and we're off again. All kidding aside. Do you agree? 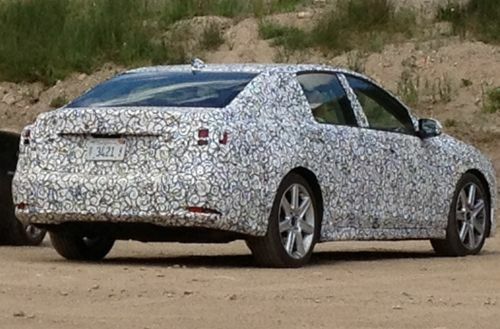 Is this the 2014 Acura RL that TorqueNews caught testing in Colorado? Yes....that is the 2014 RLX (will not longer be called the 'RL' going forward). I'm just curious if that was the FWD version with the PAWS (Precision All-Wheel Steering) based on the wheels.